The Old Piano is on the Country Sampler album and was written by Don Haywood, a talented multi-instrumentalist and singer-songwriter. Vocals are by Carol Stober, Bass and harmony vocals by Jackie Stober Garner, and on guitar is Jerry Kimbrough, Piano by Dino Pastin and Hoot Hester plays mandolin and fiddle. Engineer; Alfred Stober; and Carol Stober, at Burns Station Sound in Burns, Tennessee. 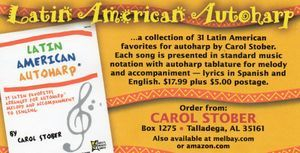 Carol's newest book "Latin American Autoharp is a collection of both traditional and contemporary songs For more information about it and her other books and recordings click on "More" at the top of the page.